ESH Gallery is pleased to reopen the exhibition season with HARMONIC SHAPES. Works by Agustina Bottoni and Domitilla Biondi, organized for the Milan Fall Design Week 2018. The exhibition presents two artists, very separate in terms of background and artistic techniques used, but whose works present a dialogue with each other through a combination of shapes and colors celebrating delicacy in an all-female exhibition. Agustina Bottoni, an Argentine designer with a Masters in product design from the NABA in Milan, is interested in finding materials and techniques to explore the new languages ​​of everyday objects. Her works, presented at the Salone del Mobile, Maison & Objet and Triennale Design Museum, embrace the precision of design and the craftsmanship tradition, creating sculptural installations that stand out for their extreme finesse given by light shades and synthetic compositions. 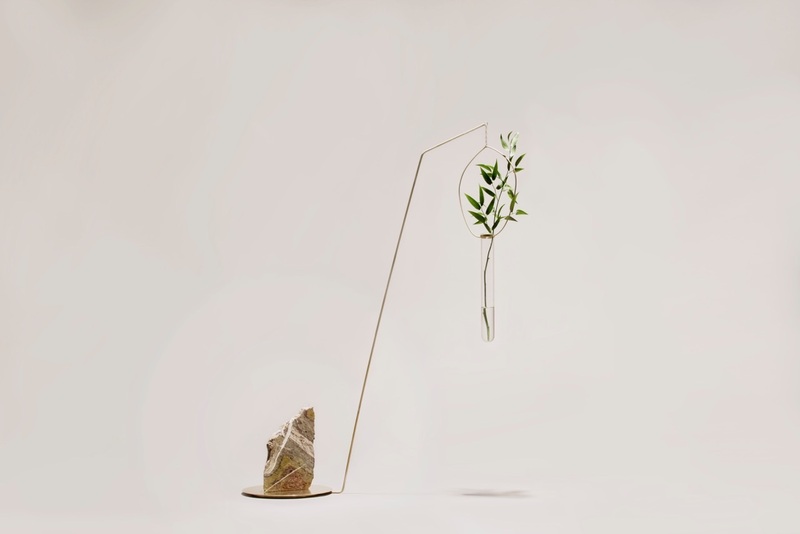 Among the works presented are her Eden series, in which kinetic sculptures composed of small floating vases celebrate the natural beauty and balance in its apparent simplicity. Each glass element, containing a flower or a plant, oscillates in space, giving the atmosphere a delicate elegance that bears witness to the personality of Agustina. For the first time, the artist will exhibit some unpublished hand-made tapestries from the Soft Composition series - a collection that contributes to underlining the interest in the traditional craftsmanship of her country - characterised by geometric patterns that mark space according to harmonic and sensual rhythms. The most representative work to give shape to the relationship between the two artists is Melodicware, a sonic sculpture in which a gentle touch of the brass bells activates a movement able to create random melodies that radiate celestial musical notes. The effect, specially chosen by the artist, creates an intimate and fleeting relationship between the work and the person, giving tranquility to the environment and thus entering into contact with the sound energies sought in the work of Domitilla. Domitilla Biondi, a graduate in Graphic Design, has been dedicating herself for some years to the engraving of bas-reliefs on white paper with scalpel, an instrument inherited from her father's profession. The mode of execution of each work is a moment of pure connection with the environment that surrounds it and detects another fundamental aspect of the artist's life. In fact, for some years she has specialized in sound therapy and meditative practice, investigated both as a passion and a profession. To realise the single carving, Domitilla lets herself be guided by the harmonic frequencies present in the environment: a moment of pure inspiration that allows it to create unique and unrepeatable works. After presenting the artists' work at the London Collect and Basel Tresor Contemporary Craft fairs, the Magnifico series will be presented for the first time in the gallery as well as some unpublished works, including the My Stupid Silly Week series. This is how the journey undertaken by the gallery continues to investigate the boundary between art and design in a journey aimed at celebrating tradition and modernity. Coinciding with the busiest autumn week in Milan, ESH Gallery offers the public a peaceful corner in the heart of the Tortona Design District. An oasis of peace where you can be guided by harmony and lightness. The exhibition is included in the events dedicated to the Giornata del Contemporaneo, the event organized by AMACI - Association of Italian Contemporary Art Museums.